Swanage. My one true love and my first taste of paradise. There you sat, all jaunty and all unassuming at the bottom of the world where the land meets the sea, meets the sky. You had sand, not the tropical kind, but rugged, misshapen sand which blew across the road in the wind and formed perfect peaks of salty, stony mess. You weren’t tropical, you weren’t especially warm and you weren’t everyone’s cup of tea. But you were mine, and you were beautiful. I played on that sand every summer, and every summer you accommodated an older, bigger person making space for what I was becoming. You changed every minute, but then again you never changed at all. The crazy golf looking out to sea, the paint peeling with cracked balls and bent clubs. The same fish and chip shop day after day, the salty hot taste lingering on my tongue until to the coolness of the ice cream washed it away. The wind breakers, the deck chairs, the jelly shoes and the cling-film wrapped sandwiches. I loved it all. Sometimes we climbed on you Swanage, we climbed way up high to look across the bay to other places that we loved – but we didn’t love them quite as much as we loved you. I sat on the grass with my grandad and counted the daisies in my hand as the sun came out from beneath the clouds and put a spotlight on that moment. We watched each day as Old Harry’s Rock came into our view, and every time I asked who Old Harry was. Each time we saw him, his wife would be somewhat changed, different. I likened it to changing her outfits each day but in reality you were eroding and changing her before our very eyes. The whiteness of those rocks and cliff edges used to sparkle against the blue sea. Although you were chalky, it never felt like school or like blackboards. It felt like starting again each summer. The freedom and the love that you welcomed me with every time I was wrapped within your arms. 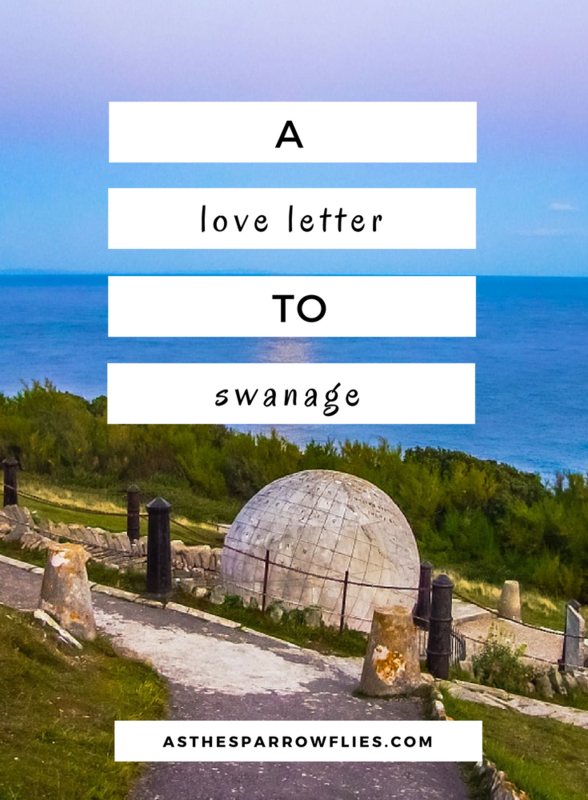 And then, despite my enduring love for you Swanage, for the bay, for the coastline, for every stretch of everything across the Jurassic way you disappeared from view. Memories bright at first, then hazy and then enveloped in the darkness of age and difference. When I talked about you fondly it was in caricatures, in sketched set-pieces that I wasn’t sure were ever real but they sounded good so they became my memories of you. But they weren’t. Because you are so much more than that to me. You are where everything started, and where everything will end. You made me. You changed me. You’ll do it again and again. Many years later, I sat inside you again, high upon a cliff face looking down on you, scrambling around and exploring and finding you for the second time. I took someone special, as someone special who was there with me once had been taken from me and I needed, wanted to remember. You were completely the same, and yet completely different. You seemed colder somehow, harsher and less forgiving of my change and my age. This time the sun didn’t shine down on that moment, instead the clouds gathered and the wind picked up pace. You always knew how to reflect my mood with one action. With silence. I remembered then, everything you are to me without the hawkish cartoons and faded half-truths. I remembered than that I am you. Without you, I wouldn’t be sat there, in that moment, sharing memories with someone new and starting again. One day, I’ll bring you the next generation of me. You’ll hold them in your sandy, loving, rugged arms the same way you held me 20 years ago. You’ll shape them, you’ll teach them and you’ll mould them. You’ll accept the change, the yearly difference in their being as now I can see you have changed. You are different too. You’ve grown and shrunk with the passing years and the weather beating down on you and the people sharing the coastline. We all change and grow, but some things will always stay the same. I love you.